Quintin S. Thompson, great-grand nephew of Abraham W. Thompson shared the following information that he wrote plus McKill Cemetery scans. This Thompson line is one of the earliest families from Southwest Vernon County. Quintin has written quite a bit more than this - I have attempted to include the parts that apply most to Vernon County. Above: Grave Marker for Rev. Abraham W. Thompson, McKill Cemetery. 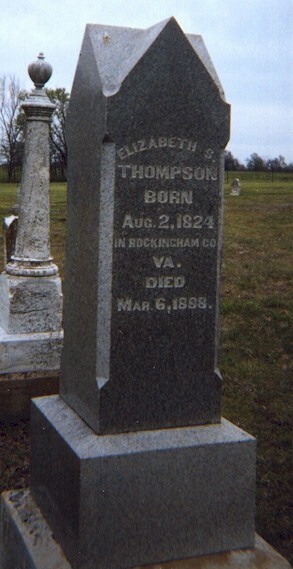 Below, Grave Marker for his wife Elizabeth Thompson, McKill Cemetery. From our early Thompson family tree we find an Abram (Abraham)(1787-1842). He was born on the eastern side of the Hudson River at Clinton, Dutchess County, New York. He died in Warren city, PA on 13 May 1842.So when Abraham (1812) was born, Abraham (1787), his uncle, was still alive. In 1832 in the Schenectady, New York area Charles Blancher Thompson (CBT) is "persuaded at the age of eighteen to enter as a probationer in the Methodist Episcopal Church, and received baptism therein." It is a good guess that Abraham (1812), his brother, was influential in that decision because by Thompson family tradition and US Federal Censuses, Abraham (1812) was an ordained minister of that church. There is a documentary gap for Abraham (1812) between Niskayuna, New York and Perry Township, Gallia County, Ohio. One has to rely on history and geography to fill in the gap. The Methodist Episcopal Church in history is noted for its itinerate preachers called Circuit Riders. That is to say their preachers on horseback would go from place to place to evangelize communities. They might pastor one or more congregations whether in a home or in a structure built for that purpose. At this point in time Abraham (1812) seems to be unmarried and would be ideal for this type of ministry. In the 1850 US Federal Census for Ohio young Abraham is in the Township Perry of Gallia County near the large city of Gallipolis along the Ohio River. QST note: Today this Perry still carries the name Township whereas the Perry northeast of Cleveland near Lake Erie is deemed a city. To confuse the issue more, there is a Perry Township in Lake County, one in Stark County in which is the large city of Massillon west of Canton. To the west there is the one in Wood County south of Toledo. Farther south in Allen County, Logan Countyand Montgomery County, west and southwest of Dayton are others. Back to the east, Tuscarawas County also pays tribute to Commodore Oliver Hazard PERRY who was victorious on Lake Erie during the War of 1812 by naming one of its townships Perry. Between the cities of Lancaster and Zanesville Perry is elevated to the status of County. But the place that interests us is southward in Gallia County near Gallipolia along the Ohio River. The US Postal Service has their Zip Code to help the confused. From the 1850 Census we can find that Abraham was ministering to a farming community about 15 miles upland from the city of Gallipolis in southern Ohio along the Ohio River. The area had assorted occupations that catered to farmers. There is recorded nine blacksmiths, seven cabinet makers, three physcians, carpenters, wagon makers, merchants, chairmaker, clerks, tavern keeper, shoemakers, stone cutter brickmason, cooper, miller, teamster, many laborers, and abundance of farmers and only one minister (MEPC). It appears that Abraham was the only resident minister in the area.. US. Circuit riders, many of whom were laymen, traveled by horseback to preach the gospel and establish churches until there was scarcely any crossroad community n the United States without a Methodist presence. What prompted Abraham and his family to move to Kansas is unknown. In the 1860 Kansas Territory US Federal Census (July 9th) we find our Abraham W. Thompson-40 with his wife, Elizabeth-36, and four children Louisa-10, William A.-7, Charles R.- 5, & Dora-2) in the town of IOLA in the County of Allen in eastern part of the state near the Neosho River. Note: What is lacking is Mary Koontz who would be 58. With the age of Dora being 2 and born in Ohio we can figure that the Thompsons arrived in the area about 1859. From the 1870 MO US Federal Census in Moundville, Missouri Salina is recorded as 8 years old born in Kansas which would put them there in 1862. More accurately the following puts the family in Kansas earlier. â€In 1856, Rev. C. R. Rice, of the Methodist Episcopal Church Society, preached in the neighborhood of Humboldt, and was followed in 1857 by Rev. Mr. Thompson. (KANSAS COLLECTION BOOKS,William G. Cutler's History of the State of Kansas,ALLEN COUNTY, Part 4 ) So by calculation they were in the area for at least five years. "how" they got from point A to point B. Looking at the map the rivers of the Ohio, Mississippi, and Missouri would be the easiest way to get to Kansas. Looks like a river route of 800 plus miles. At Kansas City, MO / KS an overland trip of approximate 120 miles would get them to Iola KS. If they made the trip by boat a stop over at St. Louis, MO would be in order. It is unknown when the Abraham family left Kansas but we find them east across the Kansas / Missouri state in the town of Moundville, MO for the 1870 U.S. Federal Census in the county of Vernon. Abraham is listed at the age of 57 as a FARMER with his wife and five children. There was no Methodist Episcopal Church building in Moundville until late 1883 after Abraham had died.. Years later Moundville had two Methodist Churches: one at the for those who favored the north and one that favored the south during the Civil War. Abraham remained in Moundville until he entered his rest on Nov. 21, 1872at the age of almost 60. He was buried in the cemetery beside the McKill Chapel southwest of Bronaugh, M0 (although Bronaugh was not fouded for another 14 years after Abraham's death) just five miles south of Moundville. His wife Elizabeth later died on March 6, 1888 and was buried beside him. Her mother Mary A. Koontz (Jan 28, 1796-Sep.7, 1877) is buried next to her. And so ends one of two religious sons of Quaker parents who took different paths down life's road. Go back to the Bronaugh page.